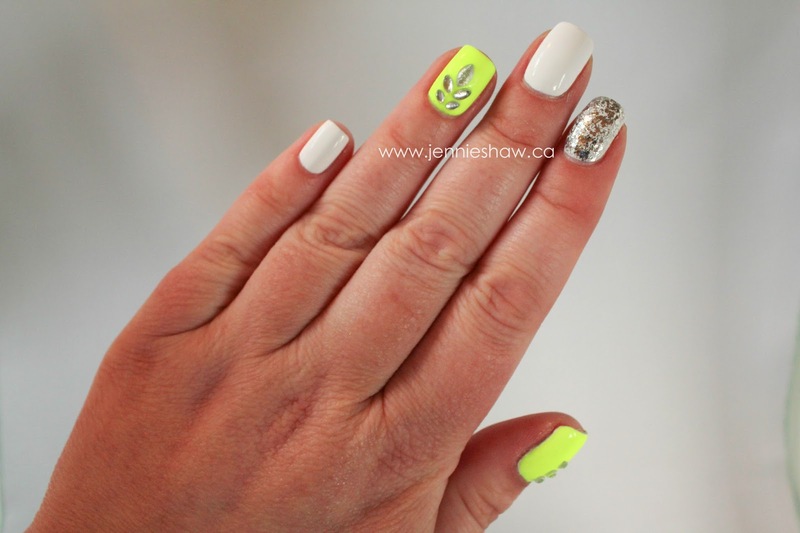 jennie's nails and tales: the nail files: neon + rhinestones = love! 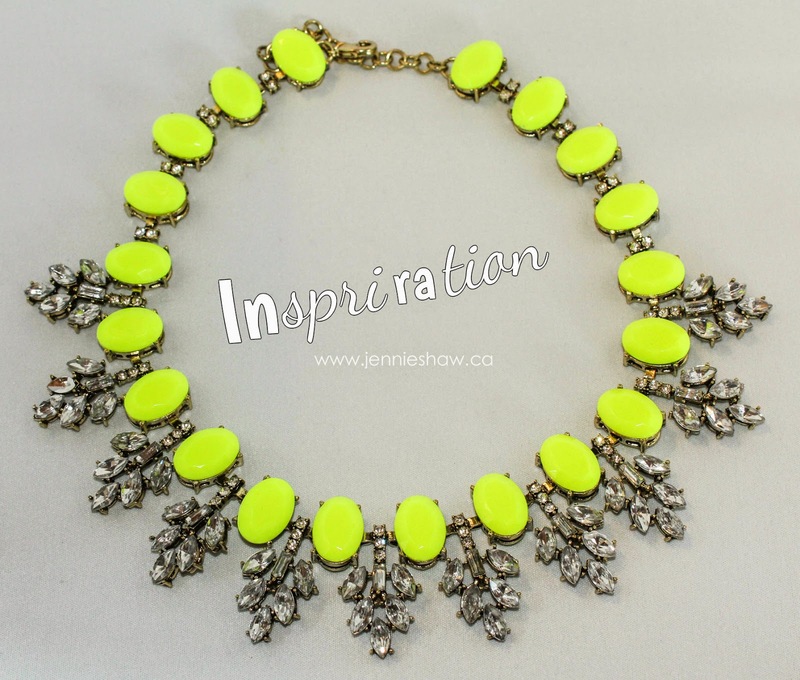 This week, I found inspiration in my overly rhinestoned jewellery collection. To start, I did two coats of Paper Mache on every finger. 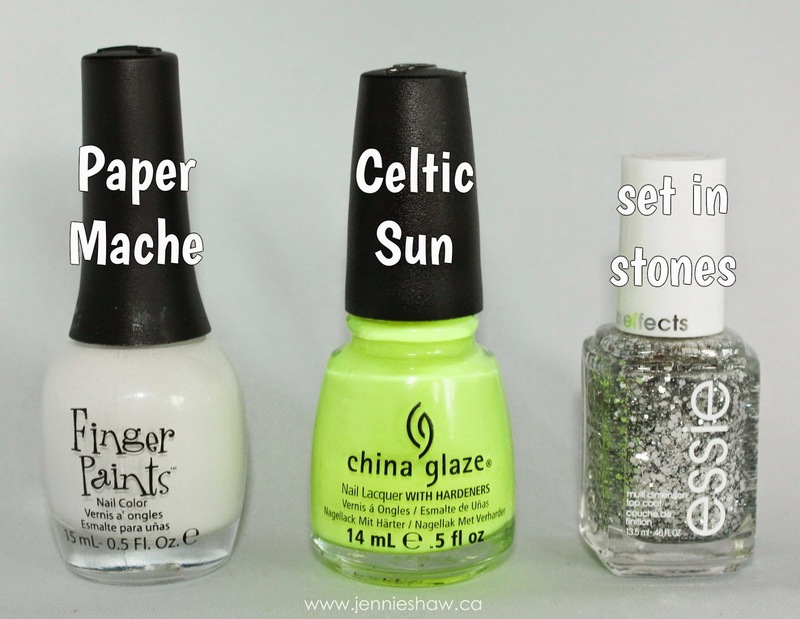 When that was dry, I applied two coats of Celtic Sun to my thumb and ring finger, and two coats of set in stones to my pointer finger. When the coloured and sparkly coats were dry, I got out my rhinestones and picked out three sizes of leaves. Arranging them like the rhinestones in the necklace, I applied them with the smallest first, at the base of my nail, and worked upwards. The squares on my thumb are all the same size, so I didn't have to worry about how they'd go down, and just placed them in the middle of my nail. A thick coat of top coat sealed everything, and after six days, the mani was still completely intact! I was amazed, considering how many rhinestones I had going on, but that top coat really kept them secure. Yay! I really love the brightness of Celtic Sun and can you ever go wrong with rhinestones? Of course not. #alltherhinestones Haha! I think my pointer finger, with set in stones, is an excellent supporting feature finger, and it balances the sparkle-ness pretty well. Yay for fun jewellery that also makes for a fun mani! Woot woot!! Have an awesome weekend, everyone! And don't forget to link up to show off your pretties! You and bailey find inspiration everywhere!! This is so fun--I really love those teardrop stones!!!! Great mani friend! Oh my goshhhhhh Jennie this is so creative! Celtic Sun is a STUNNAH and your rhinestones are such a great touch. Love Set in Stones too - I think I might need to get my hands on that one. Wow, that is a great green. I so love China Glaze. p.s. Where is everyone? I guess it's Summer, so everyone is busy? I'm in a polish group on FB & just posted my blog post for Nail files & maybe some people from there will start linking up.